Subjective well-being is a main goal in modern society, thus it is worth knowing 1) how subjective well-being differs across nations, 2) how it develops over time, 3) what the determinants of subjective well-being in nations are and 4) what the consequences of more or less well-being are. In this chapter, I focus on one particular aspect of subjective well-being, that is, life-satisfaction. I take stock of the research on this matter, drawing on the World Database of Happiness. This reveals the following patterns: a) life-satisfaction differs much across nations, b) average life-satisfaction has risen over the past decade in most nations, while inequality in life-satisfaction in nations decreased, c) several societal determinants of life-satisfaction have been identified, many of which are part of modernity, and, d) high life-satisfaction in a nation has several positive effects and pursuit of greater happiness fits as such with wider policy aims. All humans want a satisfying life for themselves and their children and this appears in high rankings of happiness in the value hierarchy of students all over the world (Diener, Suh, Smith, & Shao, 1995). Individually, people seek ways to a more satisfying life and, in Western societies, this quest manifests in soaring sales of ‘how-to-be-happy books’, such as ‘The art of happiness’ by the Dalai Lama (1998). It also reflects in the development of life-coaching businesses. Citizens in western societies call on governments for improvement of what they consider to be required social conditions, 85% of the British agree with the statement that ‘a governments prime aim should be achieving the greatest happiness of the people, not the greatest wealth’ (BBC 2006, question 14). Consequently, interest in subjective well-being is rising among policy makers; it is a new topic on the political agenda, along with sustainability. The international conference on Happiness and Well-being held at the UN headquarters in New York in April 2012 (Thinley, 2012) is a recent manifestation of this trend. The subsequent decision of the General Assembly in June 2014, to celebrate an ‘International Day of Happiness’ on March 20 every year, illustrates its importance. This call for greater well-being creates a demand for information. Policymakers seek answers to the following questions. Is greater well-being in the country possible? Policymakers will hear some experts say that pursuit of greater happiness for a greater number is pointless. A common argument is that subjective well-being depends on comparison with compatriots, and that relative differences do not change when absolute conditions improve for everybody in the country (e.g. Brickman & Campbell, 1971). Next, there is the theory that subjective well-being depends very much on ‘national character’, which is rooted in historical conditions, such as the many revolutions in France, which have created a cynical view on life among the French, as Inglehart (1990, p. 30) suggests. The first thing a government needs to know is whether subjective well-being in nations is immutable. How does the country do well-being wise? Once it is clear that average subjective well-being in a nation can change, the next step is to estimate the chances for creating greater well-being in one’s own country. This requires a view on how well people currently feel in your country, which calls for survey studies. The next step is comparison, both comparisons of present day sense of well-being with subjective well-being in earlier times in one’s country and with subjective well-being in other countries. Governments can then see how their country is doing well-being-wise on a range between the highest and lowest levels ever observed in other nations. Since most governments are also concerned about equality among their citizens, they are also interested in dispersion of subjective well-being in their country, and how this compares to inequality in the sense of well-being in other nations. Can governments do much about how well citizens feel? If the level of well-being in a country lags behind the possible level, the next question is whether a government can change that situation for the better. In this context, a first question is to what extent the differences in subjective well-being are in things that are beyond the control of governments, such as a prevalence of depressive genes in the population, poor climatic conditions or historical legacies. If subjective well-being in a country appears to depend on things that can be changed, the next question is whether a government can bring about that change. This is the question of limits to social engineering. In this context, it is worth knowing how other governments have fared in their attempts to improve subjective well-being in their countries: Have they made any difference or have attempts to create a better society mostly resulted in the opposite as critics of utopian engineering suggest (e.g., Avery, 2000)? What can governments do to foster subjective well-being? If a government decides to pursue greater subjective well-being in their country, the next question is where to start. In this context, a government typically wants to know whether there are pockets of misery in their countries, or actually, whether there is any truth in the claims about subjective ill-being in particular categories of citizens advanced by organized advocacy. Taking a broader view, governments would like to know what the drivers of differences in subjective well-being among citizens are: in particular, to what extent these correspond with things over which a government has some control, such as income, schooling, health care and safety. Again, this typically involves the sifting of competing claims of special interests, presented by lobbyists. Interior struggles also call for information about winners and losers of particular policies, for example, whether the emancipation of women will come at the expense of the well-being of men and children. In an even wider perspective, which some governments take, questions about societal conditions for happiness arise. 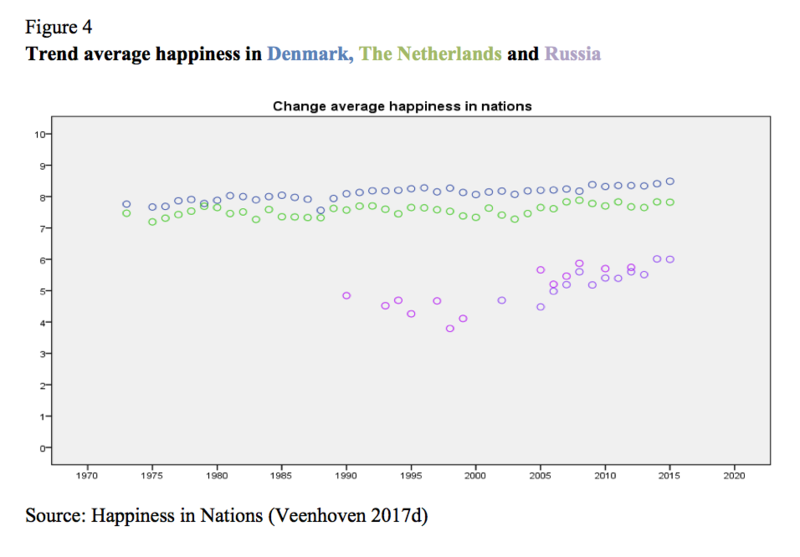 What are the secrets of the happiest countries, such as Denmark? Are they in institutional things such as a strong welfare state? Are they found in the political regime, such as interest groups having much voice? Or is the high level of happiness due to particular policies, such as promotion of equal rights for men and women? What is the role of the well-being professions, such as psychologists and life-coaches? How compatible with other policy aims? Subjective well-being is only one of the aims states pursue and typically not a very prominent one. This begs the question of how well the pursuit of greater subjective well-being fits major policy aims, such as economic competitiveness, political democracy and social peace. In this context, one question is to what extent the things required for greater subjective well-being will also add to these causes, such as schooling adding to both subjective well-being and economic growth. Or, how the question is put most of the time, to what extent do the things government does anyway for other causes also add to subjective well-being. A related question is what will be the consequences of greater subjective well-being: will it foster decadence and decay, as some prophets of doom predict, like Huxley (1932), who depicted happy citizens as shortsighted consumption slaves. Or will a happy populace be more productive, democratic and peace minded, as is now commonly assumed in positive psychology? These contradictory speculations call for empirical assessment. In this chapter I explore the knowledge required to answer these questions. I start with a conceptual analysis and focus on subjective well-being in the sense of life-satisfaction in section 2. I describe how that concept is measured in section 3. Next, I provide an overview of the research findings on differences in life-satisfaction across nations in section 4. I review the determinants of these differences in section 5. I consider the consequences of more or less happiness in nations in section 6 and present an agenda for further research in section 7. When used in a broad sense, the term ‘well-being’ is synonymous with 'quality of life' or with 'happiness’ when used in philosophy. In this meaning, well-being denotes that a life is good, but does not specify what is good about that life. The word ‘well-being’ is also used in more specific ways, and these meanings can be clarified with the help of the classification of qualities of life presented in Scheme 1. Vertically in Scheme 1, there is a difference between chances for a good life and actual outcomes of life. Horizontally, there is a distinction between external and internal qualities. Together, these two dichotomies mark four qualities of life, all of which have been denoted by the term 'well-being'. Livability of the environment. The left top quadrant denotes good living conditions. Economists sometimes use the term 'welfare' to indicate this meaning. 'Livability' is a better word, because it refers explicitly to a characteristic of the environment. Politicians and social reformers typically stress this quality of life. Life-ability of the person. The right top quadrant denotes inner life-chances. That is, how well we are equipped to cope with the problems of life. This aspect of the good life is also known by different names. In biology, the phenomenon is referred to as 'adaptive potential'. Elsewhere, it is denoted by the medical term 'health'. Sen (1992) calls this quality of life variant 'capability'. I prefer the simple term 'life-ability', which contrasts elegantly with 'livability'. This quality of life is central in the thinking of therapists and educators. Usefulness of life. The left bottom quadrant represents the notion that a good life must be good for something more than itself. This presumes some higher value, such as ecological preservation or cultural development. In fact, there is a myriad of values on which the usefulness of a life can be judged. Moral advisors, such as your pastor, emphasize this quality of life. Satisfaction with life. Finally, the bottom right quadrant represents the inner outcomes of life. That is the quality of a life in the eye of the beholder. As we deal with conscious humans, this quality boils down to subjective appreciation of life. This is commonly referred to using terms such as 'subjective well-being', 'life-satisfaction' and 'happiness' in a limited sense of the word. This is the kind of well-being I deal with in this chapter. This brings us to the question of what 'satisfaction' is precisely. This is also a word with multiple meanings and again we can elucidate these meaning using a simple scheme. Scheme 2 is based on two distinctions; vertically between satisfaction with parts of life versus satisfaction with life as-a-whole, and horizontally between passing satisfaction and enduring satisfaction. These two bi-partitions yield again a four-fold taxonomy. Pleasures. Passing satisfaction with a part of life is called 'pleasure'. Pleasures can be sensory, such as a glass of good wine, or cerebral, such as the reading of this text. The idea that we should maximize such satisfactions is called 'hedonism'. Part-satisfactions. Enduring satisfaction with a part of life can concern a domain of life, such as ‘working-life’, and an aspect of life, such as its ‘variety’. Sometimes the word happiness is used for such part-satisfactions, in particular for satisfaction with one’s career. Peak-experience. Passing satisfaction can be about life-as-a-whole, in particular when the experience is intense and 'oceanic'. This kind of satisfaction is usually referred to as 'peak-experience'. When poets write about happiness, they usually describe an experience of this kind. Likewise, religious writings use the word happiness often in the sense of a mystical ecstasy. Another word for this type of satisfaction is 'enlightenment'. Life-satisfaction. Enduring satisfaction with one's own life-as-a-whole is called 'life-satisfaction' and commonly referred to as 'happiness'. Elsewhere I have delineated this concept in more detail and defined happiness as 'the overall appreciation of one's life-as-a-whole' (Veenhoven, 1984). This paper is about subjective well-being in the sense of life-satisfaction that is, enduring enjoyment of one’s life as a whole. Life-satisfaction is something we have in mind. Consequently, life-satisfaction can be measured using questions, that is, by asking people how much they enjoy their life-as-a-whole. Questions on happiness can be posed in various contexts; clinical interviews, life-review questionnaires and survey interviews. The questions can also be posed in different ways; directly or indirectly, and by means of single or multiple questions. All questions on subjective well-being that have ever used were checked for fit with the above definition of happiness2. About half failed that test for face-validity. Accepted questions are listed in the collection ‘Measures of Happiness’ of the World Database of Happiness (Veenhoven, 2017c). Many misgivings have been advanced about such self-report of life-satisfaction; it has been doubted that responses validly reflect how people feel about their life, that responses are erratic and incomparable across persons and cultures. Though plausible at first sight, these qualms have not been supported by empirical research, see for example Diener & Oishi (2004), VanPraag & Ferrer-i-Carbonell (2004) and Veenhoven (1984, 2008a). Other indications for the validity of happiness self-reports are: their stability over time, fit with rating by others and correlation with various aspects of a good life, such as reported in this paper. Particularly telling is that self-reported happiness predicts longevity (Veenhoven, 2008b). 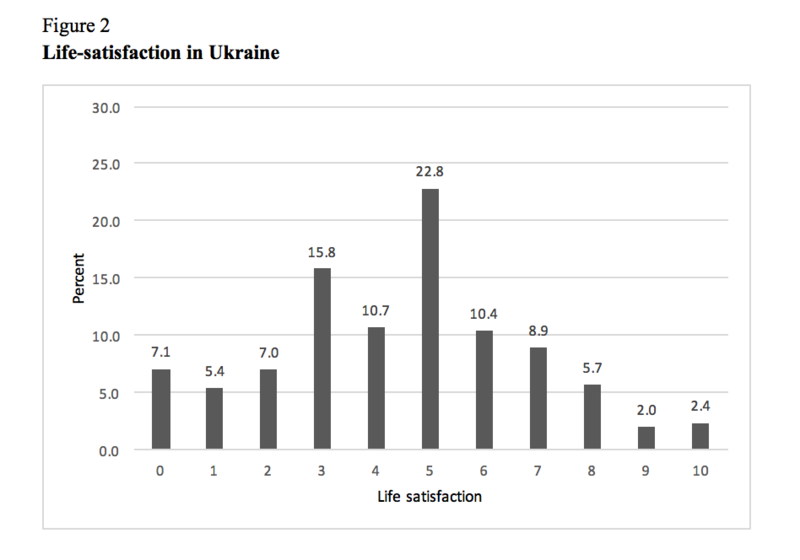 Questions on life-satisfaction are commonly used in large-scale survey studies, such as the General Social Survey in the USA and the Eurobarometer in the EU. This has taught us much about the differences in life-satisfaction within and across nations. Research findings on life-satisfaction in nations are gathered in the World Database of Happiness (Veenhoven, 2017a-f). This ‘findings archive’ involves two kinds of research results: distributional findings on how satisfied citizens are in particular times and places and correlational findings on things that go together with more or less life-satisfaction in countries. To date (January 2018) the archive lists 85434 distributional findings on life-satisfaction in the general public in 173 nations in different years (Veenhoven, 2017d), and some 1000 correlational findings about societal characteristics that correspond with more or less life-satisfaction in a nation (Veenhoven, 2017e). In this chapter, I use the World Database of Happiness as an online appendix. This allows me to sketch the main trends, without going into detail, since the reader can check in the database. The findings archive is continuously updated and this will allow the reader a view on research findings that have become available after this chapter was published. An overview of the most relevant entries in the World Database of Happiness to date (January 2018) is presented in scheme 3. Happiness has now been assessed in most countries of the world, a notable exception being North Korea. A world map of happiness is presented in Figure 3. Differences in average happiness are indicated by the shade of the green; the darker the green, the happier the people in the nation. 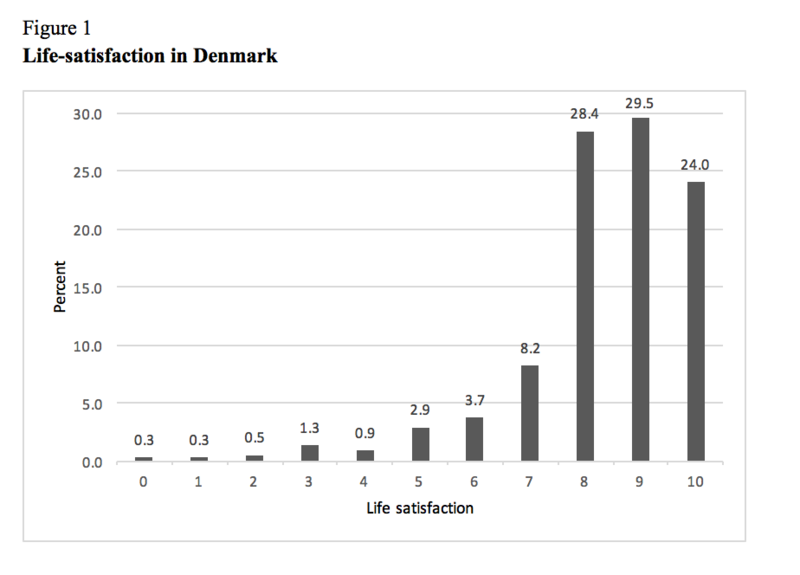 One can now see that the high average happiness in Denmark is typical for developed nations. One can also see that the low level of happiness in Zimbabwe is no exception, since happiness is equally low in most African nations. Latin America surprises us in this picture, with higher scores than one would expect based on the news reports emanating from that region. Survey research on life-satisfaction started in the late 1940s and took off in the early 1970s. Until recently, it was difficult to discern a pattern in the data; changes over time tend to be small and our view of a trend is often blurred by minor variations in sampling and questioning. Now that we have more and better data, we can see that life-satisfaction has risen in most nations, though not in all (Veenhoven, 2014). Some illustrative cases are presented on Figure 4. This rising level of life-satisfaction is accompanied by a decline of inequality in life-satisfaction among citizens as measured by the standard deviation (Veenhoven, 2017g). As we have seen in section 4.2, there are large differences in average life-satisfaction across nations and this has instigated much research on the causes of these differences. The findings can be ordered using the different kinds of well-being presented in scheme 1; part of the findings concern variation in external living conditions in nations and fits the livability quadrant upper-left in scheme 1. Another part of the findings is about variation in inner characteristics and fits the upper-right life-ability quadrant of scheme 1. Findings on the relation between average happiness in nations and livability factors are presented in table 1 and findings on the relation between average happiness and modal life-ability of inhabitants are presented in table 2. The many dark shaded cells in these tables indicate that the subject is well -researched. In the column ‘partial’, the dark shaded cells denote that many attempts have been made to clean the zero-order correlation from spurious effects, typically using regression analyses involving many controls. Since national characteristics are typically much inter-twined, this involves a risk of underestimation. The blank cells indicate that no data is available yet. The main findings about the relation between external living conditions and average life-satisfaction in nations are summarized in table 1. Wealth. People live typically happier in rich countries than in poor ones. This difference is at least partly due to an effect of material affluence as such, since much of the correlation remains when other nation characteristics, such as climate, are controlled. Analysis of change over time reveals that economic growth goes together with rising happiness (Veenhoven & Vergunst, 2014). This contradicts the well-known ‘Easterlin Paradox’, which holds that rising wealth in nations does not add to the happiness of citizens (Easterlin, 1974). Economic growth adds more to happiness in poor nations than it does in rich ones. Freedom. People also live happier in nations that provide the most opportunities to choose. Economic freedom adds more to happiness in developing nations than in developed ones, but political freedom correlates stronger with happiness in developed nations. Data on private freedom are limited to developed nations. A related finding is that people live happier in individualistic cultures than in collectivistic ones (Veenhoven, 1999). Correlations between freedom and happiness are much reduced when economic development is controlled. The rise of liberal values in Western nations (Inglehart & Wetzel, 2005) goes together with a rise in average happiness (cf. section 4.3). Equality. Gender-equality stands out as a strong correlate of happiness, but income-equality does not. The positive correlation with gender-equality is largely due to a greater opportunity to choose. The non-correlation with income equality is probably the result of both positive and negative effects that balance out (Berg & Veenhoven, 2010). Security. Surprisingly, there is no correlation between murder rate and average happiness in nations, probably because of the small number of people affected. Below we will see a much stronger correlation with corruption, which affects a greater share of the population. At first sight, social security is positively correlated to average happiness in nations (Pacek & Radcliff, 2008), but analysis of change over time does not show a decline in happiness in western nations following cuts in welfare expenditure (Veenhoven, 2011). Institutional quality. People live happier in well-organized societies, where they can count on rule of law and where government organizations function properly. This pattern also appears in a negative correlation with corruption. In the case of government effectiveness, the ‘technical’ quality of the bureaucracy counts more than its ‘democratic’ responsiveness. The effect of quality of government on the happiness of citizens is stronger in developed nations than in developing ones, among other things because central coordination is more required for the functioning of complex modern societies (Ott, 2010). Much of the correlation with institutional quality remains when wealth of the nation is controlled, which is again a rather severe test, since institutional quality is an important determinant of economic success. In this line, it is argued that institutional quality also facilitates success in individual lives, since it provides us with a predictable environment in which we are not too dependent on kin and can safely invest in our future. At this point, there is an important connection between institutional quality and freedom. Irrespective of these effects on personal goal achievement, a solid institutional environment is rewarding in itself, like playing a soccer match is more pleasurable when the rules of the game are respected. Frey, Benz, and Stutzer (2004) refer to this effect as ‘procedural utility’. Modernity. Most of the above-mentioned societal correlates are part of the 'modernity' syndrome and more direct measures of modernity also show a strong correlation with average life-satisfaction, such as urbanization and globalization. The more modern a country, the happier its citizens are. This finding will be a surprise to prophets of doom, who associate modernity with anomie and alienation. Though modernization may involve problems, its benefits are clearly greater (Veenhoven & Berg, 2013). The macro-social conditions listed in Table 1 together explain about 75% of the differences in average happiness in nations depicted on the world map on Figure 3. Since measurement error in all variables is likely to have attenuated the coefficients, this is close to perfect correlation. Explained variance is lower in individual level analysis when country characteristics are entered after personal characteristics. Less research has been done on the relation of average happiness in nations with psychological characteristics of the population. The following findings are listed in table 2. Self-direction. Life-satisfaction is typically higher in nations where inhabitants take control over their lives. This appears in positive correlations with measures of modal individualism, internal locus of control, intrinsic motivation and self-confidence. Several of the national character traits mentioned below are also indicative for the ability to take control over one’s life. Mental health. Life-satisfaction is typically lower in nations where a greater share of the population is in poor mental health, as appears in high rates of anxiety, neuroticism and psychoticism. Personality. Life-satisfaction tends to be higher in nations where the following personality traits are the most common: extraversion, and openness for experience. Life-satisfaction is lower in nations where people are the most competitive. Average life-satisfaction in nations appears to be unrelated to modal agreeableness and conscientiousness. Trust. A lot of studies show that life-satisfaction is typically higher nations where people trust their fellow citizens and public institutions, and where tolerance is high. Most of the above findings support the view that happiness in nations depends to a great extent on freedom of choice. This involves an external opportunity to choose and the internal capability to choose. External opportunity to choose requires that there is something to choose, and modern affluent societies typically offer more options than traditional and poor societies do, among other things in occupations and marriage arrangements. A further requirement is that choice is not limited, by law or informal pressures, e.g. that gay people can live a life that fits their sexual orientation. Though all societies will set some restraints to free choice, the restraints are less in nations that score high on freedom and tolerance. Internal ability to choose requires awareness of alternatives, which will be higher in nations where openness for experience prevails. It also requires an inclination to choose, which is reflected in the findings on self-direction and a positive stance to pleasure. A further requirement is the mental strength to choose, which will be higher in populaces in good mental health and with a rational outlook. Together, these conditions allow people to choose a way of life that fits them best and to escape from situations in which they feel unhappy (Abdur Rahman & Veenhoven, 2017; Brule & Veenhoven, 2014). Though choice involves costs, the benefits clearly prevail. That fact fits the view that human nature tends to a preference for independence (Veenhoven, 1999). Above, we have discussed the observed correlates of average life-satisfaction in nations as causal factors. Yet reversed causality is also possible, a happy populace can stimulate the economy in various ways and can foster freedom and equality in a country. A happy population may also adopt socialization practices that foster the development self-direction, mental health and trust. Research at the micro-level of individuals has revealed effects of life-satisfaction that could work out this way (e.g. Lyubomirsky, King, & Diener, 2005). At the macro-level of nations, considered in this chapter, we are not yet able to disentangle causes and effects of subjective well-being. So much, for what we do know now. What do we need to know more about subjective well-being in nations? Follow-up. As noted above we cannot yet distinguish causes and effects of life-satisfaction. Though this will always remain difficult at the macro-level of nations, we will be able to shed more light on this issue when more trend-data become available for a greater number of countries. The many white cells in the ‘longitudinal’ columns in tables 1 and 2 illustrate that there is still a long way to go. Causal paths. Assessing the direction of causality is one thing. The next step is to assess how causality works. Several mechanisms have been suggested in section 4.1, but yet it is difficult to demonstrate such effects empirically and to assess their relative importance. Specifications. Most cross-national studies have looked for effects of social conditions on the happiness in the general public. Yet some effects are likely to be contingent on persons and situations, for example, a high degree of freedom in a country may be more beneficial for higher educated citizens than for their low educated compatriots and may add more to happiness in stable countries than in situations of social turmoil. Research on such differences will allow governments to make more informed policy choices. The many white cells on the right in the tables 1 and 2 illustrate that there is still a world to win. Fit with wider policy goals. The available findings on determinants of average life-satisfaction in nations suggest that the pursuit of greater happiness fits well with several current policy goals, such as economic growth, freedom and good governance. The findings on consequences of happiness also suggest synergy with several common goals, such as furthering civil participation. Yet we are not yet able to see synergy and conflict in much detail. We need a better view on causes and consequences of life-satisfaction in nations to include this aim in standard policy analysis. 1This chapter draws on several of my earlier publications, in particular on Veenhoven, 2015. 4Among these are multiple findings in the same year in particular countries, often involving multiple measures of happiness. Combined, the number of country/year observations is 2472. Abdur Rahman, A., & Veenhoven, R. (2017). Freedom and happiness in nations: A research synthesis. Applied Research on Quality of Life, online publication. Avery, T. (2000) Popper on ‘social engineering’: A classical liberal view. Reason Papers, 26, 29-38. Berg, M., & Veenhoven, R. (2009). Geloof en geluk in landen. Ethiek en Maatschappij, 12, 49-69. ISSN 1373-0975. Berg, M. & Veenhoven, R. (2010). Income inequality and happiness in 119 nations. In B. Greve (Ed.) Social Policy and Happiness in Europe (pp. 174-195). Edgar Elgar. Brickman, P. & Campbell, D.T. (1971). Hedonic relativism and planning the good society. In M. H. Appley (Ed. ), Adaptation level theory, a symposium (pp. 287-302). London: Academic Press. Dalai Lama & Cutler, H. (1998). The art of happiness: A handbook for living. USA: Riverhead Press. Diener, E. & Oishi, S. (2004). Are Scandinavians happier than Asians? Issues in comparing nations on subjective well-being. In F. Columbus (Ed. ), Asian Economic and Political Issues (Vol 10, pp. 1-25). Diener, E., Suh, E.M., Smith, H. & Shao, L. (1995). National differences in reported subjective well-being: Why do they occur? Social Indicators Research 34, 7-32. Easterlin, R.A. (1974). Does economic growth improve the human lot? In P.A. David & W. R. Melvin (Eds. ), Nations and households in economic growth (pp. 89-125). New York: Academic Press. Frey, B.S., Benz, M. & Stutzer, S. (2004). Introducing procedural utility: Not only What, but also How matters. Journal of Institutional and Theoretical Economics, 160, 377–401. Huxley, A. (1932). Brave new world. Stockholm, Sweden: Continental Book. Inglehart, R. (1990). Culture shift in advanced industrial society. Princeton, USA: Princeton University Press. Inglehart, R. & Wetzel, C. (2005). Modernization, cultural change and democracy: The human development sequence. New York: Cambridge University. Lyubomirsky, S., Diener, E. & King, L.A. (2005). The benefits of frequent positive affect: Does happiness lead to success? Psychological Bulletin, 131, 803 – 85. Mauss, I.B., Anderson, C.R., & Tamir, M. (2012). The pursuit of happiness can be lonely. Emotion, 12, 908 - 912. Ott, J.C. (2010). Good governance and happiness in nations: Technical quality precedes democracy and quality beats size. Journal of Happiness Studies, 11, 353-368. Pacek, A. & Radcliff, B. (2008). Assessing the welfare state: The politics of happiness. Perspectives on Politics, 6(2), 267-27. Schooler, J.W., Ariely, D. & Loewenstein, G. (2003). The pursuit and assessment of happiness may be self-defeating. Paper, University of California, 2003, Santa Barbara, USA. VanPraag & Ferrer-i-Carbonell (2004). Happiness quantified: A satisfaction calculus approach. Oxford University Press, UK. Veenhoven, R. (1984). Conditions of happiness. Dordrecht, Netherlands: Reidel (now Springer). Veenhoven, R. (1999). Quality-of-life in individualistic society: A comparison in 43 nations in the early 1990's. Social indicators Research, 48, 157-186. Veenhoven, R. (2000). The four qualities of life: Ordering concepts and measures of the good life. Journal of Happiness Studies, 1(1): 1-39. Veenhoven, R. (2008a). 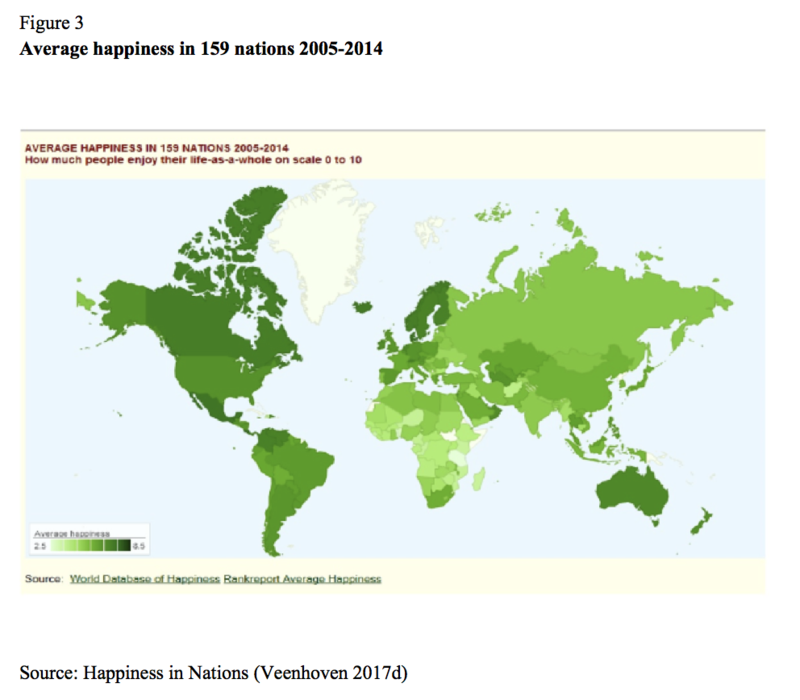 Comparability of happiness across nations. School of Sociology and Social Work Journal, 104, 211-234. Veenhoven, R. (2008b) Healthy happiness: Effects of happiness on physical health and the consequences for preventive health care. Journal of Happiness Studies, 9, 449-464. Veenhoven, R. (2011). Happiness and society. Soziale Sicherheit (Social Security,) 9, 298-302. Veenhoven, R. (2014). Long-term change of happiness in nations: To times more rise than decline since the 1970s. In K. Sheldon, & R. Lucas (Eds. ), Stability of happiness: Theories and evidence on whether happiness can change (pp. 167-200). Elsevier Publishing. Veenhoven, R. (2015a). Informed pursuit of happiness: What we should know, do know and can get to know. Journal of Happiness Studies, 16(4), 1035-1071. Veenhoven, R. & Berg, M. (2013). Has modernization gone too far? Happiness and modernity in 141 contemporary nations. International Journal of Happiness and Development, 1, 172-195. Veenhoven, R. & Vergunst, F. (2014). The Easterlin illusion: Economic growth does go with greater happiness. International Journal of Happiness and Development, 1(4), 311-343.